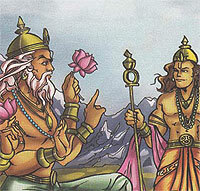 Indra was once sitting in his court with the other gods, when Virihaspati, his guru, appeared. All the gods stood up to pay respect to Vrihaspati but proud Indra remained seated. Vriuhaspati felt insulted and left. Realising his mistake, Indra went to Vrihaspati's ashram to apologise. Vrihaspati saw him coming but he was too angry to meet him and so he disappeared. Disappointed , Indra returned. Vrishavarsha, a demon came to know about the conflict between Indra and his guru. To take advantage of this situation, he attacked heaven. Without his guru's blessings, Indra could not defend his kingdom and lost it to Vrishavarsha. Indra went to Brahma for help. Brahma told him to make Sage Vishwaroopa to become his guru. Vishwaroopa agreed and with his blessings, Indra won his kingdom back.